Prenatal yoga is a wonderful exercise and form of stress relief for a pregnant woman. It balances posture, allowing her chest to expand more easily as her growing belly impedes on breathing. As her joints relax, yoga’s gentle strength training movements strengthen the muscles around those joints and in her core to support her growing baby and swaying back. Yoga improves circulation, benefiting the transport of nutrients throughout the mother’s body and womb. It heightens body awareness, allowing the mother to nurture and support herself and baby as pregnancy gives way to its continual changes. Yoga also provides her with the right “tools” for natural childbirth. Breath work, meditation and visualizations bring focus inward to listen, endure and surrender to the body’s instincts. They cultivate inner peace and strengthen the bond between mother and baby. The most comfortable positions in prenatal yoga, in fact, are often intuitively sought out during labor and birth. 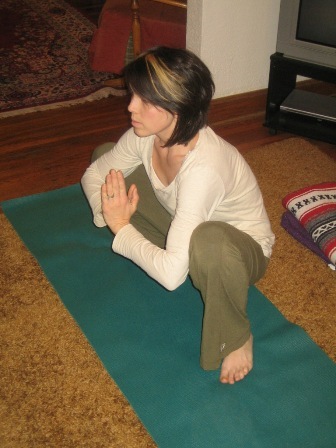 By regularly practicing these poses she becomes comfortable in them and moves into them more readily when the time comes. Downward Facing Dog is recommended more for labor than childbirth because the leg muscles could grow too tired while standing during birth. During labor, however, downward facing dog releases pressure from the sacroiliac joints and stretches out the spine, relieving some lower back pain. Full downward dog is most beneficial in the first stages of labor where a mother may still feel like walking around or being active and needs some way to stretch and pause during contractions. Downward facing dog can be assumed as its full pose or modified by placing hands on a chair or coming down to the knees in puppy pose. In any of these positions, a partner can easily place pressure on hip and back muscles where it is needed to aid in the mother’s laboring. 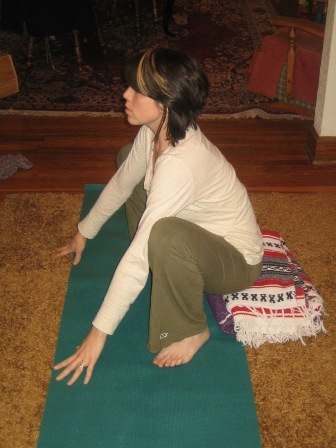 Cat pose also stretches the spine and lower back and positions a woman so her partner can easily apply pressure to this area. Pelvic tilting and rocking offer an intuitive rhythm that allows her to focus inward with her breath. Moving into this all-fours position also opens the pelvis to its widest because the mother’s sacrum is flaring out behind her and pressure is being placed on the pubic symphysis, which causes it to expand. This is one of the most beneficial positions for childbirth! 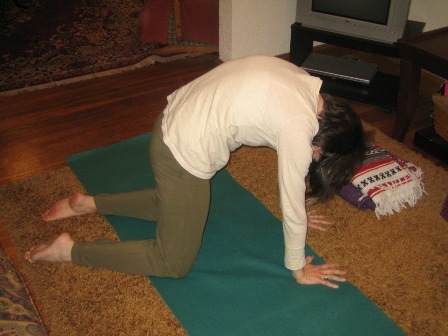 Cat pose can be assumed as usual on all-fours or modified by draping arms over a chair, exercise ball, or mound of blankets and pillows. Squatting opens the pelvis in the same way that an all-fours position does, making it another one of the best positions for childbirth. Since the mother is upright, gravity also helps to move her baby down the birthing canal and pressure placed on the uterus intensifies contractions. It should be noted that squatting relies heavily on the leg muscles, thus should be practiced throughout pregnancy by moving in and out of full and half squats or holding the full squat (modified or not) during yoga sessions. I had a lot of back labor in my first birth, too, and while I got some relief with back stretches I really wish I had known more about how yoga can help labor and birth. With my second birth, after having taught all of this, birth was amazing. I hope they do the same for you! Also, you might check into some local yoga studios that offer prenatal yoga. Sometimes you can get lucky and find a prenatal instructor that focuses on using yoga during labor and birth or offers a workshop on it. So interesting… I know nothing of yoga. But, when I was laboring with my little guy, I used all of these poses instinctually. They worked! Little Guy was born drug-free and I can’t complain about the pain – it hurt, but not as badly as when I had son #1 without allowing myself to move freely! That’s awesome! Isn’t it incredible how well our bodies just *know* what to do if we are willing to surrender and listen? And the connection that instinctive birthing has to this ancient practice of yoga really says a lot about how powerful and healing both can be. I tried Yoga for the first time while 4 months pregnant, watching a dvd. It was so calming and really helped loosen me up. Sadly I gave it up when I injured myself, I could really feel a difference when I stopped! If I could do it over, I’d have gone to an actual class, it would have been worth it. This is interesting. I will definitely keep this in mind for later in life when I decide to become pregnant.